Jamie and Gladys Scott received the news on December 29 that their 16-year prison ordeal was over at last: Mississippi Governor Haley Barbour commuted their double-life sentences and ordered them out of prison. They were originally accused of having taken part in an $11 robbery! Even the good news comes with certain reservations. The governor might have granted full pardons as a gesture toward fairness in light of the clear miscarriage of justice their sentences represent. Shockingly, he stipulated that the younger sister must donate a kidney to the ailing elder, thus saving the State of Mississippi the cost of dialysis! The governor’s pettiness has drawn statements of outrage from the local Jackson Clarion-Ledger as well as the New York Times. When the two young mothers were barely in their twenties, two white men accused them of having taken part in robbing them. African American males had actually carried out the robbery, but they drew light sentences after testifying against the Scott sisters. 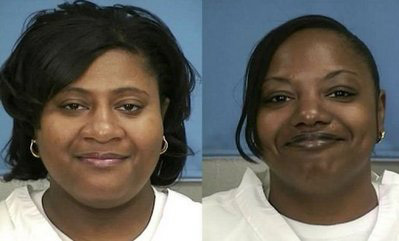 It has never been fully explained why Mississippi Judge Marcus Gordon decided to impose the severe life sentences on the two young women. After their years-long suffering, local journalists were able to get the attention of the NAACP, which led to a barrage of publicity in national journals, including peoplesworld.org. Nationwide outrage had an impact, apparently leading Mississippi officials to relent. President Ben Jealous of the NAACP focused on the good news in his nationwide e-mail message: “Gladys and Jamie Scott are returning home for the first time in 16 years … Jamie and Gladys always described the moment the police arrested them as a nightmare. Not just for themselves, but for their family – for their children. So we united together. We fought the injustice – just as the NAACP has done for more than 100 years. President Jealous asked people to write “welcome home” letters to Gladys and Jamie Scott from the NAACP’s web site at http://action.naacp.org/WelcomeHome. Mississippi booking photo from http://news.yahoo.com/nphotos/Miss-free-Scott-sisters/ss/events/us/123010kidneysisters. Jamie is on the left. The younger sister, Gladys, is on the right.